Friday flashback to vintage Brisbane of 1928 and the iconic Queensland Irish Association, located on Elizabeth Street in Brisbane city. The Queensland Irish Club building in 1928. In 1919, businessman, architect and politician James Cowlishaw financed the Queensland Irish Association’s (QIA) purchase of a building (later known as Tara House) with a mortgage of £8,000 (purchase price was £11,000 – $815,000 today). The QIA fell upon hard times and in October 2015 went into liquidation. Subsequently Tara House was sold in November to a private investor for $8.1 million. The Queensland Irish Club building in 1937. 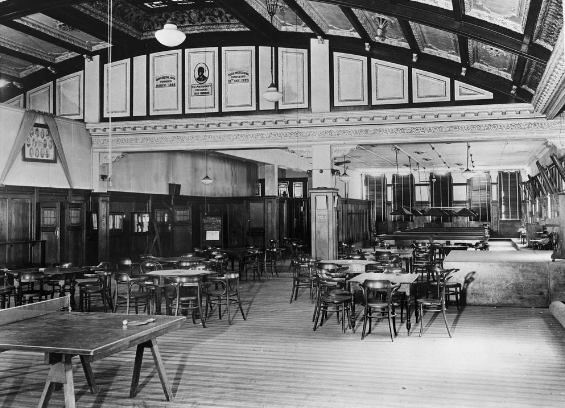 Interior of the Queensland Irish Association. Tara House was placed on the Queensland Heritage Register in 1992 due to the original facade (still intact today), the workmanship of the internal renovations, and its historical significance for its association with the Irish community in Brisbane and the Queensland Irish Association. Images and information from the State Library of Queensland. Read more about the Queensland Irish Association here on the State Library of Queensland website.